Disk Surgery Cases — Kenneth T. Kaan, M.D. The spine is composed of vertebral bodies and discs. When a disc is herniated, it may press on or irritate the nerve roots, resulting in pain or numbness in the extremities. A discectomy is performed to remove the offending disc material and alleviate the mentioned issues. The case below is that of a 35-year-old male who complained of severe pain in his left rear leg, weakness when toeing off his left leg, as well as numbness in the back of his left leg and the side of his left foot. Non-operative treatment failed to solve his symptoms. Dr. Kaan conducted an Minimally Invasive Discectomy, resulting in complete relief of the patient's thigh, leg, and foot pain and resolution of his neurological symptoms. This surgery was perfomed as an outpatient through a 20mm incision. Degenerative Spondylolisthesis is forward slip of one vertebral body on the adjacent vertebral body. It is a result of degeneration of the facet joints and commonly causes spinal stenosis (narrowed nerve canal) with resulting pain in the legs (radicular pain). The treatment is decompression and fusion if nonoperative treatment fails. The following patient is a 48 y.o. female who has complaints of longstanding severe low back pain and right back of thigh and leg pain. She has failed nonoperative treatment and had a spinal cord stimulator inserted. She was seen by Dr. Kaan for definitive treatment. Radiographs show a 40% slip of L4 on L5 and severe disc degeneration. 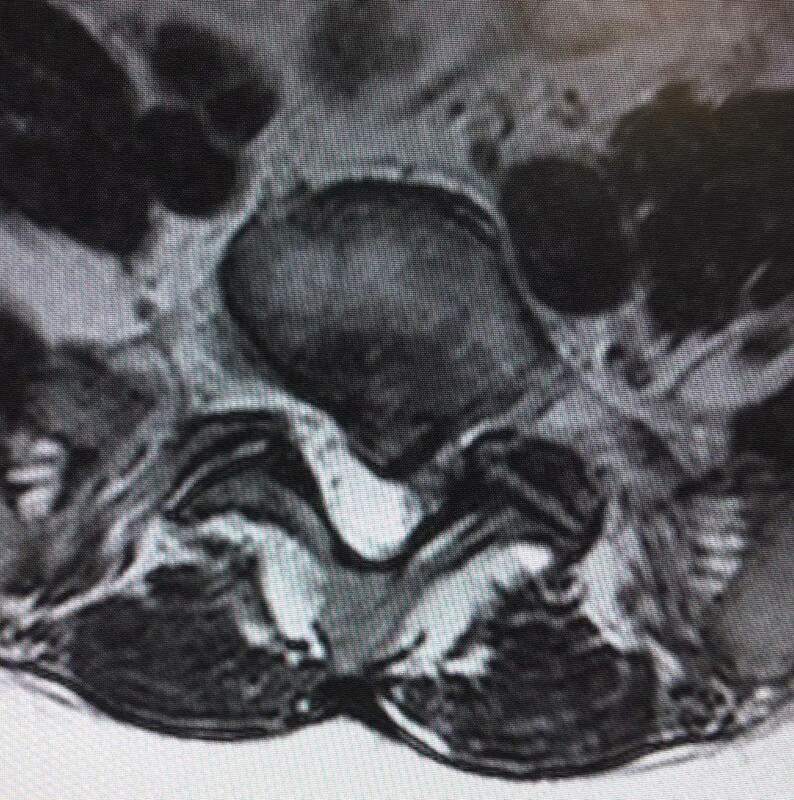 CT scan shows narrowing of the nerve canal and pinching of the nerves, causing right lower extremity pain. Side view shows disk degeneration and spondylolisthesis (i.e. slipped spine) at L4-5 resulting in the patient's low back pain.